Years ago I had a memorable autumn lunch at Chez Panisse Café: ravioli with butternut squash, browned butter, and sage, followed by lemon verbena tisane and this fabulous dessert. Really good ingredients — a high-quality vanilla ice cream, a perfectly ripe and pulpy persimmon, and freshly toasted walnuts — transform the simple into the sublime. Cut the persimmon in half, then scrape the pulp from the skin with a spoon. Purée the pulp in a small food processor or blender for about 15 seconds, or until smooth. Taste for sweetness and add about a teaspoon of honey or sugar if you like. Toast the walnuts in a skillet over medium heat, shaking the pan frequently, until they are slightly darker and fragrant. Remove to a cutting board and coarsely chop them. 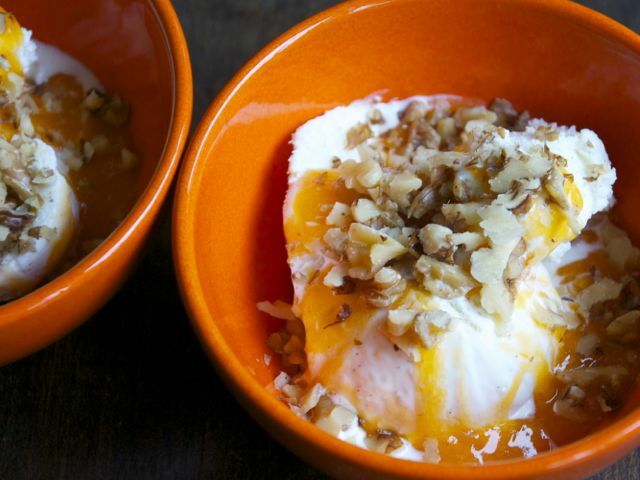 Scoop the ice cream into bowls, spoon the persimmon purée over the ice cream, and top with the chopped walnuts. Serve immediately.